Hey, Mikael from Housemarque here. A few months after the release of Resogun we bumped into Eugene Jarvis at DICE Summit 2014, where he received a Pioneer award for his contribution to the gaming industry. Eugene, creator of arcade cult classics such as Defender, Robotron, and Smash TV, has always been one of our major sources of inspiration for the kind of games we are famous for. You can see Eugene’s invisible hand in the gameplay of Dead Nation, Alienation, and — of course — Resogun, which is Defender’s “spiritual successor.” What makes both of our philosophies resonate is that we believe games should be fun, fast, and brutal. We stayed in touch. He played Resogun. And when we asked if he wanted to do something together, he jumped on board without hesitation. We are now proud to show you the result of that collaboration. 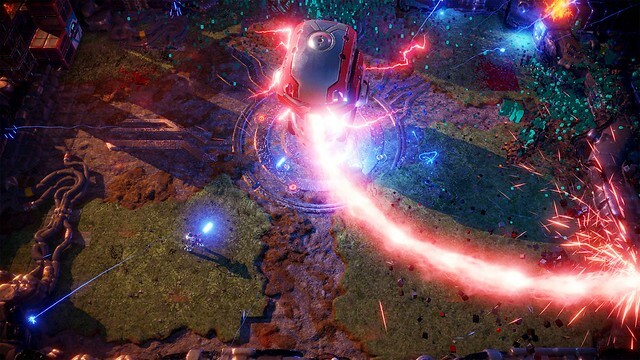 What was called for a long time “the Jarvis Project” we can now reveal as Nex Machina (Which, roughly translated, means Death Machine) — the most explosive top-down action shooter Housemarque has ever created. 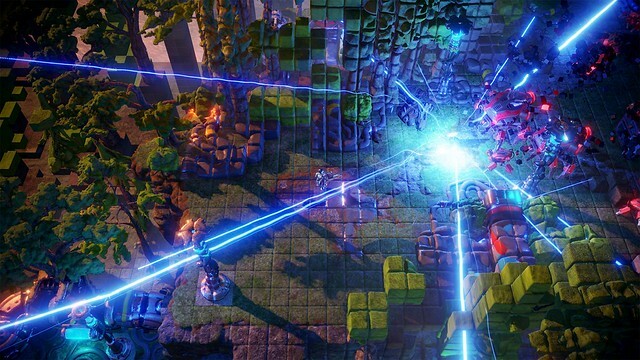 Taking hints from both Robotron and Smash TV, Nex Machina focuses on pure arcade action, voxel destruction, and competition. But before delving into more of that, I want to talk about the game’s setting. After the singularity, the rise of the machines was inevitable — and unstoppable. But nobody even noticed. Mankind’s best and brightest were too busy updating their status on social media. When all seems lost, out of the blue a mysterious hero appears: you. Who sent you? Will you save humanity from itself once again? And last but not least, are your skills sharp enough to confront an army of fiendish robots out for blood? We’ve been thinking long and hard about how to bring back a “true arcade experience” in a world where arcade halls are almost extinct. Nex Machina is our shot at cracking that problem, and over the next few months we’ll have more information on what you can expect on day one. For now, rest assured that the game will provide the classic Housemarque arcade experience and a kickass competitive framework, which we will expand over time to make it the obvious choice for players looking for a challenge. Hoping you have fantastic local co-op in this as usual! I am so excited for this! Housemarque games are always great, and this looks like it’s right in line with what to expect from them. You had me at Housemarque. Godspeed Housemarque! Love you guys and a huge fan of Mr. Jarvis. Looks amazing and can’t wait to purchase day one! I will always buy anything Housemarque puts out without question. They have never let me down. Your games are always super fun to play. This one looks like it’ll be great too. Every game has been top notch. We’ll be able to easily tell when they turn evil and the revolution is upon us! I have only one thing to say…Housemarque you guys were born to make games. Its impressive how every game you guys announce already has the seal of pure awesomeness on it. Any game with the Housemarque name on it is a must buy for me. Will say again,best PSN game devs ever. Can’t wait for this game, also the music is so good.. I loved Resogun. Looking forward to this.